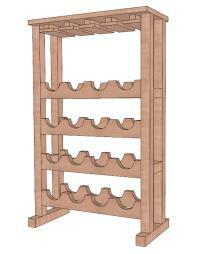 Free wine rack plans offer more than an opportunity to create custom wine storage for your home. Building your own rack can be less expensive than buying one at retail price, so why not experience the satisfaction of building a rack with your own two hands and save a little money while you're at it? Explore this list of free plans to find just the right design for your storage needs, and then get busy building it! Not every wine rack is right for every home. Pick the plan below that suits your needs and space. The freestanding model is perfect for a large space, while the tabletop one is great for small storage areas. The rounded top on the oak rack is a lovely alternative to the two rectangular options. Each plan will open as a pdf document and includes a materials list, tools list, illustrated directions, and 3D image of the model. If you need help downloading the plans, check out these helpful tips. There are many other fantastic resources on the Internet that offer access to no-cost design plans that yield outstanding results. Browse through this list to find your ideal project. Woodworkers Workshop: This is an excellent online resource that offers projects ranging from a single wine bottle holder that consists of a piece of wood with a specially positioned hole to stellar alternatives to traditional wine cellars. Wine Intro: This site offers directions to make an inexpensive rack that uses PVC pipe for a super simple design. 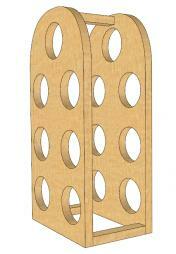 Dempsy Woodworking: Dempsy features a large plan that has the capacity to hold 172 bottles. This design is very flexible and uses a simple diamond cross pattern. Free Wood Woodworking Plans: This site displays a list of options ranging from wine boxes and caddies to a wine buffet cabinet. Craftsmanspace: This site offers a free, downloadable pdf file that contains plans for a modular wine rack that you can customize to your needs. Unique Projects: The free plan offered here will help you create a wall-mounted rack, and you can choose between several variations in the design. There are a few important points to consider before you select a particular plan. 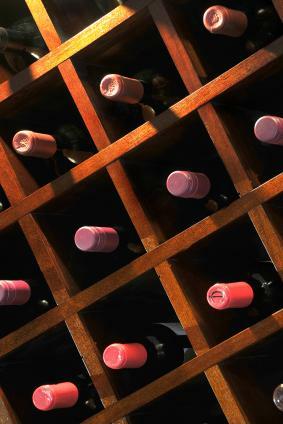 Wine racks are more than display cases, and it is important to consider the function of the rack before delving into any project. The following factors play a significant role. Take stock of your carpentry skills and try to select a plan you're sure you can handle. If you have limited experience with woodworking, it's better to select an easier plan rather than one that is beyond your skill level. 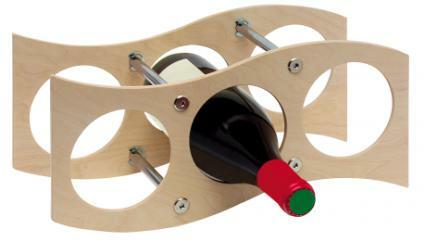 Fortunately, there are many wine rack designs that are quite simple yet just as attractive as the more detailed designs. If you're ready for more of a challenge, select an intermediate to advanced plan. Tools and materials vary according to the specific project. Some plans require no woodworking skills at all. The plan that you select should reflect how the wine is stored. For example, you might want to create a storage unit under your kitchen cabinets for easy access. 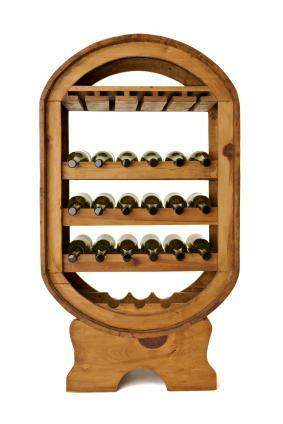 One plan found at Lowe's Creative Ideas is a prime example of a free wine rack design that is ideal for very short storage time. 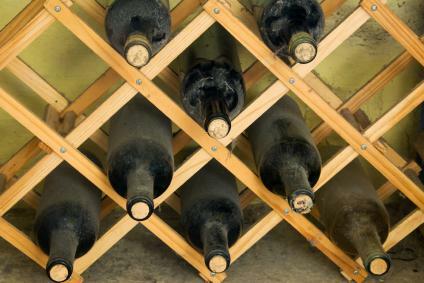 The kind of temperature fluctuations that take place in a kitchen space are too extreme for long-term wine storage. The size of the unit is another factor to consider. Depending on your specific needs, you can opt for a space-saving design that hangs on the wall, a single bottle holder or a collection of wine bottle holders. There are so many designs to consider that it can be difficult to narrow down your choices to a single plan. Begin by visualizing your space and making a sketch of your ideal storage unit. Once you have an idea of the size rack you want, how long you'll need to store your collection and the style of rack you like best, you should have no trouble finding the perfect free wine rack building plan to suit your taste and your carpentry skills.